After my ritual early morning walk with Putto, our Swiss Shepherd, I met a friend for coffee and we discussed the wonders of social media. Recently (by accident) I discovered a lovely shoot on Pinterest with our range of table decor – orbs and himmeli’s. Much to my delight, I have to admit! Done for television, the Pretty Blog, along with the help of Elizabeth from Bon Ton Events created this beautiful shoot. 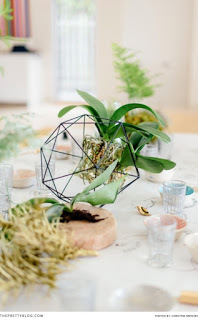 The table was decorated with a combination of geometric shapes, chemistry tubes and botanical details. The chemistry idea was to touch on the concept of a ‘chemical explosion’ happening when tasting the different ice-creams with the liqueurs. The botanicals was a creative way to use plants you already have, as table decor.